Many legendary Wayne films visited these beautiful Colorado locales to capture a true Western look. The idea for writing a story about films shot in Colorado occurred to me many years ago on a visit to Ouray, Colo. While having a drink at Outlaw Restaurant, the bartender told me the hat hanging on the wall behind the bar once belonged to John Wayne. The story goes that while Wayne was filming “True Grit” in the late 1960s, the superstar ate at Outlaw Restaurant several times. I’m unsure of whether it would have been called the Outlaw Restaurant at the time because prior to 1968 it had a different name. Regardless, Wayne allegedly liked the place so much that he gave his cowboy hat to the restaurant on his last visit. It’s been hanging behind the bar ever since. Whether this is lore or the truth, it’s a good story. It’s not in dispute that “True Grit” was partly filmed in the Ouray area. In fact, according to IMDB.com, it was shot in Ouray, Ridgway, Montrose and Gunnison along with sequences shot in Durango, New Mexico and various spots in California. Visitors flock to Ouray for various reasons; ice climbing and backcountry skiing in the winter and hiking, jeeping and canyoning in the summer. However, the main draw to Ouray is the hot springs pool. This historic pool recently underwent a major remodel and is now better than ever. With several breweries and a beautiful distillery, I think Wayne, who was known to like a stiff drink, would have appreciated modern day Ouray just as he did back in the ’60s. 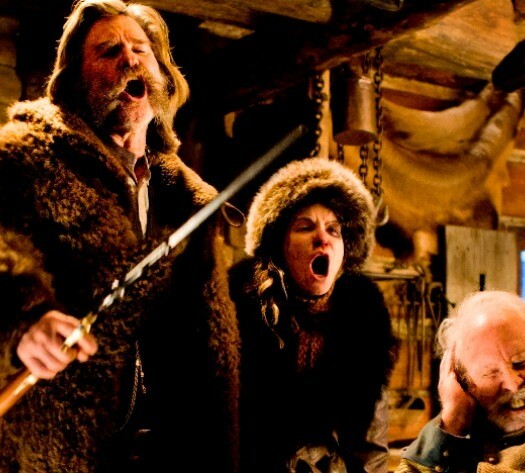 Die-hard fans can find a play-by-play of “True Grit” locations in the San Juan Mountains by visiting ColoradoVibes.com. Denver’s Westword newspaper calls “The Searchers” (1956), “… only the best American film ever made.” While much of this Wayne movie was filmed in Arizona and Utah, parts were filmed in Aspen and Gunnison, Colo.
Gunnison is located along the Gunnison River and is a fisherman’s paradise. Along CO-135, heading towards Crested Butte, there are multiple streams and rivers teeming with trout. Even the bald eagles get in the game along the East River near Almont. 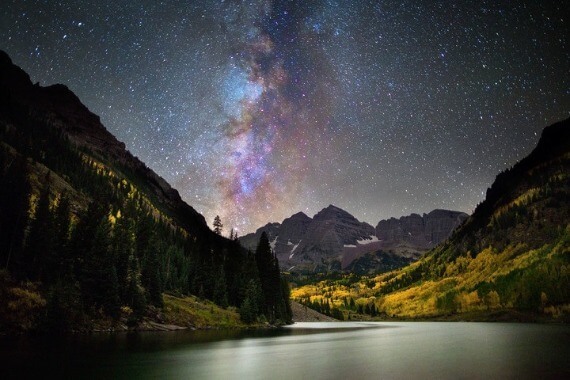 Aspen is best known today as the playground of the rich and famous. It’s also a draw for adventure seekers who want to raft raging whitewater or spend the day hiking the Maroon Lake trail and take in the postcard-perfect scenery. Aspen also boasts a scrumptious food scene with farm-to-table restaurants like Meat & Cheese, opened by the owners of Avalanche Cheese Co. in nearby Basalt, and many other restaurants sourcing local, Colorado ingredients. Wayne’s “The Cowboys” (1972) was almost entirely shot in Southwest Colorado with brief stints in New Mexico and Arizona. It seems appropriate that this particular film utilized this area because it’s still home to many real-life cowboys. Visitors can see these men and women strut their skills at the Red Ryder Rodeo Grounds in Pagosa Springs, Colorado. 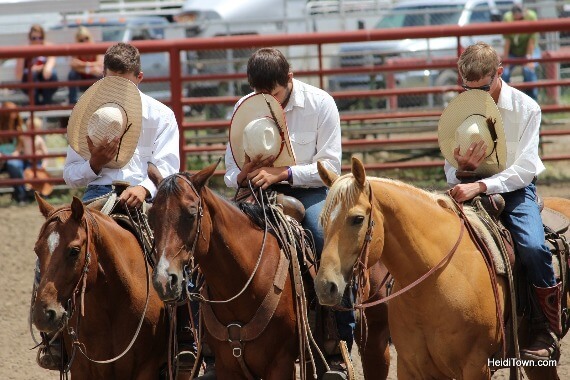 Cowboys bow their heads in prayer during a Pagosa Springs rodeo performance. During the summer, a series of rodeos takes place on these grounds, and it’s not just for show. I attended a ranch rodeo here several years ago, and members of the participating teams all work ranches around the Southwest United States. Pagosa Spring is best known for their three public hot springs that I’ve written about on HeidiTown.com. Colorado’s railroads, specifically the Durango & Silverton and the Cumbres & Toltec Scenic Railroad, have played significant roles in western films. The latter is my favorite scenic train ride in Colorado because of its length and authenticity. 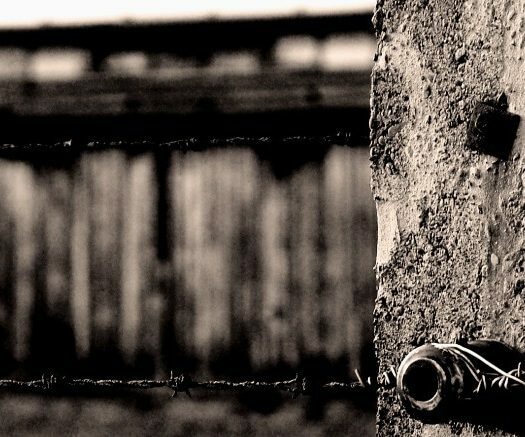 No train lover should miss it, nor should any lover of western films. Learn more at the Movie History page on the Cumbres & Toltec website. 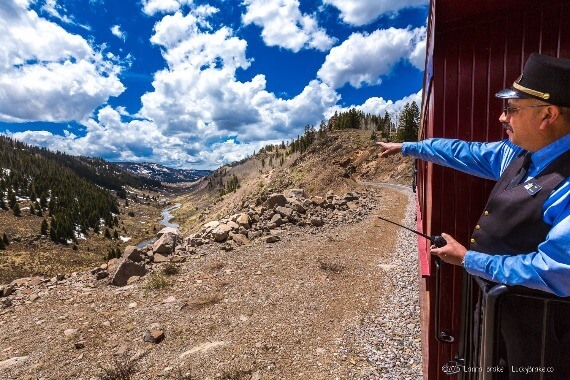 Conductor Ray Martinez on the Cumbres Toltec Rail points to another gorgeous Colorado landscape. Any true fan of western movies should also make a pilgrimage to Durango, Colorado. “How Hollywood Save the Durango & Silverton” (“True West Magazine”) explains how the film “A Ticket to Tomahawk” (1950) put Durango and its languishing narrow gauge railroad on the map and triggered the filming of many more movies in this location over the next several decades. Heidi Kerr-Schlaefer is the founder of HeidiTown.com and author of The Heidi Guide in Mountain Living. She specializes in festivals and travel in the American West.